The Chevrolet coolant temperature sensor problem remains one of those issues that can mimic or lead you to believe other problems exist with the vehicle. The perfect example is when this part sets a code P0128 in memory. The trouble code stands for coolant temperature below thermostat regulating temperature. That's the official definition from my OBD II diagnostic code book. Retrieving this trouble code might lead you to believe it's time to replace the thermostat. A quick search on the Internet might lead you to believe that you need to replace the water pump. It's easy to buy into this type of quick diagnosis. Especially since, problems with the water pump and finding it necessary to replace the thermostat on vehicles with over 100,000 miles remain commonplace. However, if the failure is with the Chevrolet coolant temperature sensor, replacing the thermostat and water pump becomes a for sure waste of time. In this article we'll talk about how to determine the coolant temperature sensor is actually the problem with the vehicle and not the other possibilities that exist. Above you'll see the component location diagram for the coolant sensor. If you can find the number one spark plug boot you'll find the sending unit. You'll need a 19 mm deep socket, but a 3/4 standard size also works. Another thing to mention, in this article we're concentrating on the Chevrolet V-8 engine. This includes the 4.8 L, 5.3 L and the 6.0 L workhorse engines. With that said, the coolant temperature sensor discussed in this post finds its way into many other Chevrolet, Buick and GMC truck engines. First, let's clear the air and state that this particular Chevrolet coolant temperature sensor is not known for its extreme reliability. This doesn't mean that every vehicle that has one needs one replaced, but it appears that very few of these trucks will make it through its natural life cycle with the original coolant temperature sender installed. What we also need to make clear is the symptoms associated with the bad Chevrolet coolant temperature sensor can vary greatly. Let me use the first and second vehicles that helped me discover this common malfunction as prime examples of the varied symptoms. The first Chevy truck was a 2003 Silverado with a 5.3 L V-8 engine. The customer complained the check engine light was on, the truck ran poorly and stalled occasionally at idle. This is the vehicle that set the P0128 for the engine coolant temperature below threshold. When I pulled the data stream up on my automotive scanner the coolant temperature read -30°F. The current outside temperature remained in the low 80s. If you can imagine the difference in the fuel mixture required to run an engine at -30°F than at 80°F then you can understand why this truck ran poorly and stalled. Here's the point I wanted to make on this particular problem. This Chevrolet truck had a bad crankshaft sensor six months ago. The driver felt the symptoms of the coolant temperature issue and that of the crank sensor problem remained similar in nature. In fact, when the customer called me to set up the appointment they said they thought the crank sensor was going bad again. On the second vehicle a 1999 Chevrolet Tahoe, the driver's complaint became a air conditioning system not cooling properly. The owner also stated the engine cooling fan ran all the time on some days. The root cause of the issue pointed back to the Chevrolet coolant temperature sensor. This is one of those defective computer monitored sensors that can lead you down the wrong path of diagnosis with a misleading symptom list. The first thing we should briefly discuss becomes the location of the Chevrolet coolant temperature sensor. On both the V6 4.3 L Vortec engine and the 4.8 L, 5.3 L and 6.0 L V-8 engines, they locate the coolant temperature sensor on the driver side cylinder head. On the V-8 models it's next to the number one spark plug wire boot. On the V6 models it's a little further back. Obviously, you should never attempt this DIY auto repair operation on a warm engine. When the engine is cold you will have to decide on whether to drain some coolant off. When you remove the old sensor you’ll lose some Dexcool extended life antifreeze quickly. If you can get the new part threaded within a few seconds, you won't lose that much antifreeze. With that said, on high mileage engines, now might be a great time to perform a preventive maintenance service at the same time. For this reason we recommend draining out the old coolant. 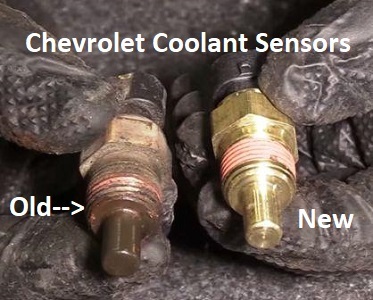 Note that both the factory installed Chevrolet coolant temperature sensor and the replacement part have thread sealer already installed on the threads. The official size of the sending unit is a 19 mm wrench or socket. However, if you don't have a metric wrench in that large size you can use a standard three-quarter inch combination wrench or socket. 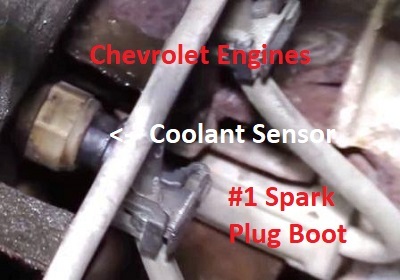 If you curious to see what it takes to replace the Chevrolet coolant temperature sensor a gentleman on YouTube put together a video showing you how. If you want to see what else we cover here on the fix my old ride website visit the home page.